It was just before 5AM on a windy Sunday morning when the Malibu fire station received the first call. 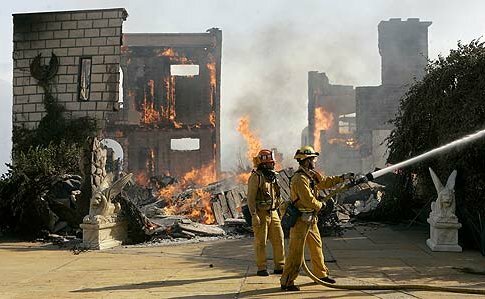 October, 21st 2007 marks one of the most destructive days in Malibu’s history. The fire began when the ritual Santa Ana winds got the best of three power poles lining a parched Malibu Canyon. Investigators with the California Public Utilities Commission concluded that at least one of those poles was illegally overloaded which quickly ignited the straw colored brush lying below. The resulting calamity would claim nearly 4,000 acres, 36 vehicles, and 14 structures. Of the 14 structures destroyed, one would standout amongst the rest. Before The Canyon Fire of 2007 there stood a residence uniquely defined from all other Malibu structures. 23800 Malibu Crest was Perched high above the Malibu Country Mart and toted a personality which begged your attention. The Malibu Castle, as it was colloquially known, was an unofficial Malibu monument. Originally built by Dr. Thomas Hodges in 1978, the Malibu castle would quickly became a celebrity in its own right. Growing up in Malibu it was common to hear conflicting rumors, stories, and history of the landmark. Some of the past rumored owners included Brad Pitt and Angelina Jolie, Bob Dylan, and Tony Robins. The most well-known former owner of the castle is Lilly Lawrence. A self-proclaimed Princess, Lilly was born in the oil-rich city of Abadan, Iran. Her Father, Dr. Reza Fallah served as Iran’s oil minister for many years. “Princess” Lilly purchased the castle in 1998 for approximately $3M. It was listed as a 6 bedroom, 8 bath, 10,500 SQFT home with ocean views, 2 apartments, and 5 car garage on 3.5 acres of land. It’s noted that after the purchase Lilly Lawrence performed extensive renovations to the property and even created a website for her new castle. The old website is still up and running and is a nice reminder of how far web design has come since the late 90s. Less than 10 years later the Canyon Fire proved too much for the castle and the fortified facade came tumbling down. Seeing the castle engulfed in flames was a surreal moment for Malibuites. The castle wasn’t just another house it was a legend permanently woven into the fabric of Malibu’s culture and history. 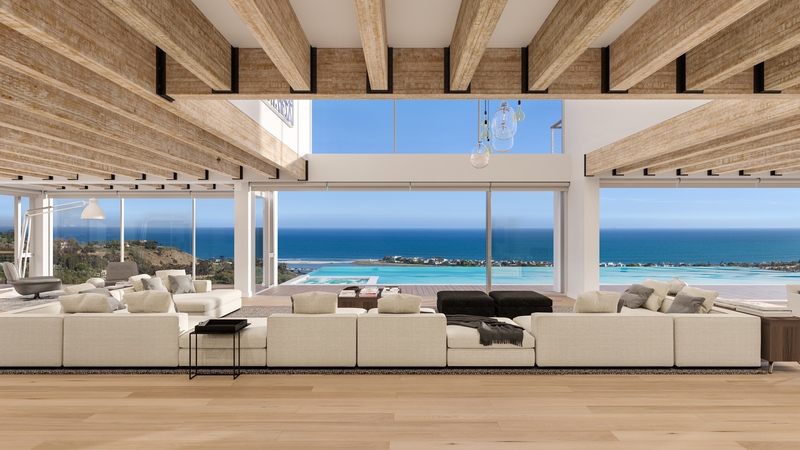 Gillen’s company UNVARNISHED has quickly become one of Malibu’s most successful design/build developers, creating such projects as “The Who”, a private Gillen designed community. In a way Gillen’s unique architectural style can be viewed as a microcosm of Malibu culture itself. Open spaces, great views, and subtle luxury. Sound familiar? The New Castle consists of two independent yet cohesive structures; an 11,000 sqft main residence and 4,200 sqft guest house combining for approximately 15,000 sqft of unrivaled interior living space. 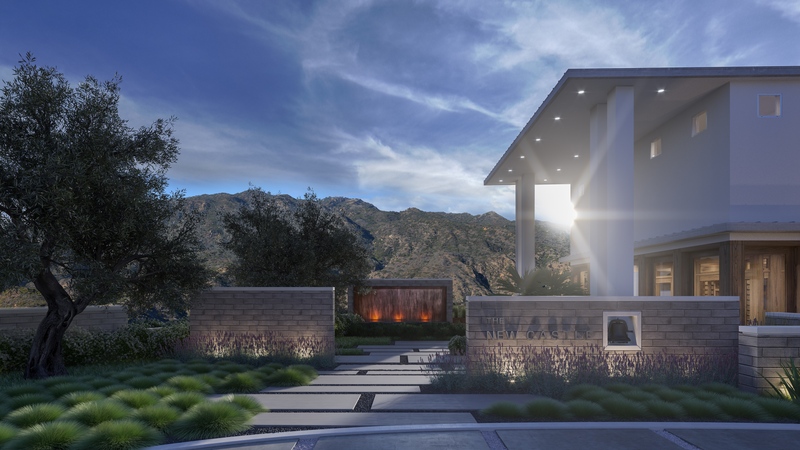 The property sits atop 2.5+ acres of prime bluff land overlooking the Santa Monica mountains, Malibu lagoon, Surfrider beach, Catalina Island and the full expanse of the Santa Monica Bay. was fortunate enough to meet with Gillen and listing agent, Sandro Dazzan to preview the nearly finished project. As I drove down the private driveway I was met by an attentive security guard with a long list of pre-approved names and vendors permitted to enter the premises. 30 seconds-in and it already felt like a castle. The 400ft private driveway and expansive motor court was lined with dozens of well-used trucks and industrial equipment, all of which was dwarfed by the towering exterior of the resurrected castle. As I approached the grand entrance I was quickly met by Gillen and Sandro who spared no time explaining the intricate details of the motor court. Capacity for 30+ vehicles, heated valet station and elegant concrete paving design. I could already hear the echoes of future party goers exiting their vehicles. As we entered the main house three things immediately stood out; open spaces, beautiful building materials, and a view of Malibu I never knew existed. Gillen prides himself on his ability to create large, open interior spaces while maintaining an intimate environment and The New Castle is no exception. The main level great room is a staggering 121ft of expansive living space unadulterated by a single post, column, or pillar; not to mention the hand-scraped wood floors, 12’ ceilings lined with rich wooden beams and walls of glass beckoning the natural beauty of Malibu inside the castle’s walls. It felt monumental in size yet inviting, warm, and suitable for both an intimate evening with a partner or the blowout party of the year. The great room opens up to the 75’ ocean view infinity pool, begging the question, is that the moat? On the west wing of the great room stood a custom built Bulthaup kitchen that perfectly compliments the clean, open, and unobtrusive interior. On the opposite end is the office which could be left open or sectioned off by 8.5 foot glass sliding doors framed in solid teak. Additional features of the great room include a walk-in wine tasting room and cigar lounge both encased in a rubik’s cube of solid teak and glass. Right away the unwavering craftsmanship, the attention to detail and the artisanal approach to every square inch of this residence is evident both visually and in the way in which Gillen spoke of his work. Like a Father boasting about their child’s accomplishments, pride was laden in every word he spoke of The New Castle. The artful, teak-wrapped steel staircase has yet to be installed so we took an aerial lift in its place. Gillen, operating the lift himself, took us to the upper level where we explored the bedrooms. Each bedroom could be the master suite in any other house but this isn't ‘any other house’, this is a castle. The thoughtful and expertly designed bedroom arrangement orients every bedroom towards a breathtaking view. You get a view and you get a view, everyone gets a view! (my first and last Oprah joke). Some of the bedroom amenities include custom built-in Unvarnished closets, desks and cabinetry, 6’ solid teak pivot doors, programable one-touch lights, blinds and climate control, built-in study stations, and an endless supply of ocean view balconies. Then there's the master bedroom. An elaborate take on the previous four, sitting high atop the castle, as it should. Simple, open, beautiful and baring the view of all views. Resting high above the heart of Malibu, and looking down upon the luxurious estates of Serra Retreat below, this room is built to awaken the royal blood within. The oversized master bath is fit with an overhead waterfall shower, custom made 5’ circular soaking tub made entirely of solid black walnut, a teak deck overlooking the water and a locker-room sized walk-in closet comprised of Bulthaup cabinetry. As we hopped back on the aerial lift and began our descent It dawned on me we still hadn’t seen the bottom level nor the 4,200sqft 2+3 guest house. I pushed my next appointment. The entire bottom level is a Gillen style salute to entertainment. 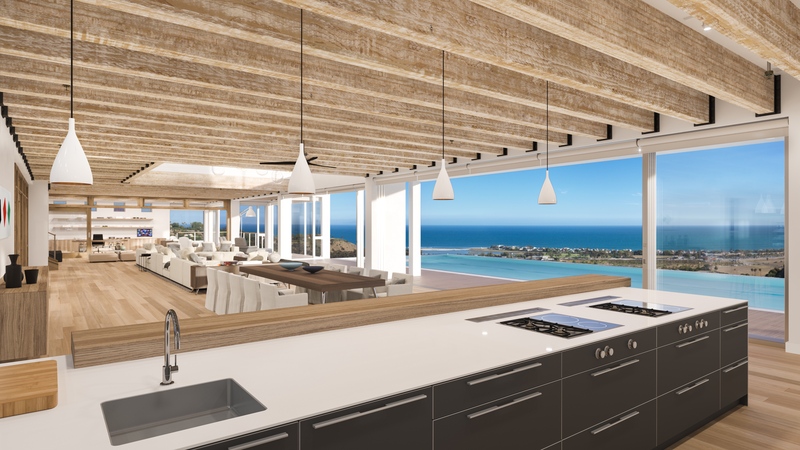 Although the room is still empty it will soon house a top-of-the-line home theatre, game area, custom teak ping pong table and one touch blackout curtains to hide that Malibu ocean view you’ve been over exposed to all day. The room opens up to yet another large teak deck overlooking the Malibu kingdom. While outside on the deck Gillen pointed upwards towards the pool/moat a story above us. “It’s a waterfall” he said. I didn’t respond, I looked and stared and realized that the pool was designed to cascade an entire level down into a large hidden reservoir below. The pool doesn't just have a waterfall, it IS a waterfall. “WOW, the pool’s a waterfall” I proclaimed, charming and clever as ever. In the natural world a forrest fire serves a very important purpose. On the surface, a fire’s initial destructive nature seems life-taking but it’s part of a natural lifecycle that is in fact “life-giving.” A fire clears new space and provides the essential building blocks for a new generation of plant-life to flourish. As destructive and unfortunate as the 2007 Malibu fire was it brought forth the opportunity for new architectural “life.” The next generation’s castle has finally risen from the rubble, it may no longer have turrets, crosses, and stone bridges but I assure you The New Castle is as monumental and regal as ever. Gillen’s ambitious project is set to be complete in the Summer of 2017 with a price tag set at $80M. A price in which you too can be woven into Malibu’s “royal” history.